Check out the LES MILLS PUMP trainers, Joel Freeman, Jericho McDuffie and Ben Feliciano talk about how LES MILLS PUMP completely transforms your body using the physiological principle of THE REP EFFECT™. Many trainers will tell you that in order to change your body shape and build muscle you need to lift heavy weights. Popular theory also states that the best way to break down fat and build new muscle is to overload the muscles with heavy weights lifted at a low rate of repetition (between 8 to 12 reps) to bring your muscles to fatigue. THE REP EFFECT™ turns that thinking on its head. It’s true that muscle fatigue is necessary for changing your body from fat and flabby to fit, tone, lean and firm. But with THE REP EFFECT™, you fatigue the muscles using light to moderate weights at a higher rate of repetition. 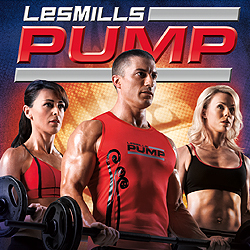 LES MILLS PUMP changes the tempo, position, and speed of your movements while using lighter weight. In a LES MILLS PUMP workout, you’ll perform between 70 and 100 repetitions per body part. That totals about 800 repetitions in a single workout – more than four times that of a traditional weight workout! So you’re breaking down more fat reserves, targeting more muscle fibers, and blasting more calories than you would wight a traditional strength-training workout. With THE REP EFFECT™, you achieve more meaningful fat loss and muscle fatigue to build strength without building bulk. That means a sleeker, sexier, stronger physique that you’ve ever had in your life. This entry was posted in Challenge Group, Les Mills PUMP, Shakeology, Trainers, Videos and tagged Account, Ben Feliciano, Body, Building, calories, CE, Challenge Group, Fiber, FREE, free challenge, GI, High, Join, Les Mills, Les Mills PUMP, Loss, Low, Moderate, Muscle, muscles, Pack, Personal, PUMP, Shake, Shakeology, shape, Support, target, Team, tho, Training, Weight, With, workout, workout program by Hank Rouse. Bookmark the permalink.